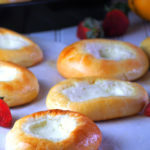 Enjoy these cream cheese brioche that nestle a creamy and citrus cream cheese filling in the center. The buttery brioche is perfect with the note of freshness and creaminess from the sugared cream cheese. In the bowl of heavy duty mixer, add the yeast, milk, egg and 1 cup all purpose flour. Mix with a rubber spatula just until combined. Sprinkle the remaining 1 cup of flour over the top as if to cover mixture. Let this stand for about 40-45 minutes. There will be cracks on the flour surface at this point. Add the sugar, salt, eggs and 1 cup of flour to the bowl with the yeast mixture. Using a dough hook, run the heavy duty mixer on low speed for about a minute until the mixture is just about incorporated. Add the remaining half cup of flour and run the mixer in medium speed. Continue to beat, scraping the bowl as needed, for about 15-20 minutes. You will know when the dough is ready if it is coming together in the center of the bowl, and also attaching itself into the dough hook. You should see the dough slapping the sides of the bowl, like it is almost violently throwing itself to the sides white it still clinging and rotating with the dough hook. You should also hear the slapping sounds. ( If you don't see the slapping action after ten minutes into the mixing , sprinkle about 2 -3 tbsp of flour to the bowl. Continue to beat until you reach the slapping stage , giving the dough a total of about 15-20 minutes in the mixer ). Now add the butter bit by bit. Make sure that the butter is in in room temperature, but not warm or oily. It should be pretty soft and malleable. It helps to enclose the butter inside a wax paper, press it down using your thumb or beat it with a rolling pin to give it a malleable consistency. When you add the butter, the dough will fall apart again for a moment. Continue to beat until you hear the slapping sounds again. This should take about 5 minutes or so. The dough is now , once again, clinging together in the center and in the dough hook with the slapping sound. Dough is sticky but shiny at this point. Place the ball of dough into a greased bowl and cover with a plastic wrap. Let stand in room temperature until the size is doubled, about 2 hours. While the dough is rising, make the filling. In a large bowl, whisk together softened cream cheese and milk until the cream cheese is broken into soft little bits. Gradually add in the sugar while mixing until the mixture is smooth. Add 1/4 to 1/2 teaspoons of lemon or kalamansi juice depending on how citrusy you want your filling to be. Refrigerate filling until ready to use. This filling is enough for the whole batch of brioche dough. Since we will be working on half the dough at a time, you can refrigerate the remaining half of the filling for up to three days until you are ready to use it with the other half of the dough. We will be baking half of the batch at a time so divide the risen dough into two equal portions. Wrap the other half in plastic and refrigerate. Preheat oven to 350 F. On a floured surface, divide the dough into 8 equal portions. Using your palms, form various shapes with the dough then flatten them to about less than half of an inch. Lay them on a large baking sheet that is lined with parchment paper. Leave enough space in between each assembled dough to allow room for their rising. Cover loosely with a kitchen towel and let rise for an hour in a warm place. When the dough has risen, preheat oven to 350 F. Using your fingers, create an indention in the middle of every risen dough so that you have a little well to put the filling in. Spoon the filling until every well in the center is filled up to the brim. Brush egg wash on the edges of the brioche dough. Bake in the oven for 12-15 minutes or until the tops are lightly golden and a thermometer registers 200 F. Store leftovers in a covered container for up to 3 days at room temperature. You can microwave them for 10-12 seconds to warm them up. Repeat process for the remaining dough and filling. Preparation times does not include chill and rise times for the dough.